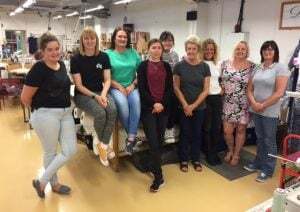 The David Nieper Sewing Academy in Alfreton has seen an influx of new recruits this season with 10 new starts in the sewing room after scoring highly in their sewing skills assessment tests. The Sewing Academy was set up in 2015 to address the chronic skills shortage in the UK’s fashion and textiles industry with the intention of developing specialist skills locally. For decades the UK’s fashion industry has designed in the UK but manufactured collections overseas, leaving a lack of skilled British dressmakers. The new team of dressmakers at David Nieper have come from a variety of backgrounds – some returning to dressmaking after career breaks, some totally new to the profession and several having recently graduated with university degrees in related subjects such as textiles. However, interestingly one common element shared among the new trainees is that several have had a mother, grandmother or family member that has either sewn as a hobby or professionally, many growing up to the sound of sewing machines at home. The Derwent Valley UNESCO World Heritage site has one of the most highly concentrated clusters of mills in the UK. We do believe that some of the industrial heritage of the area has been carried down through to the community today, with a high percentage having a natural inclination for this type of work. Lucy Eaton, a new trainee at the Sewing Academy and Fine Art a graduate from Sheffield Hallam University, took up sewing as a hobby several years ago, making her own clothes from commercial patterns with the help of her mum who is a lace maker. “After only a few weeks’ training I’ve learned so much already! I’ve wanted to do something creative and this is the perfect opportunity. It’s great working with really experienced dressmakers to learn all the essentials such as cross-stitch, overlock, lockstitch and bar tacking. After starting work on paper patterns we progress through a range of different fabrics including; pure cotton, pure silk, viscose elastane and luxury wool. The Sewing Academy acts as a platform for trainees to pursue a variety of careers in fashion manufacturing from dress making to pattern cutting, fabric cutting, design, knitwear and quality control.